Shep, a K9 officer of the Pasco County Sheriff’s Office, helped catch the driver of a stolen Ford Expedition in Florida. A Florida deputy and his K9 partner took down two suspects after splitting up, which is “unusual,” according to the agency. 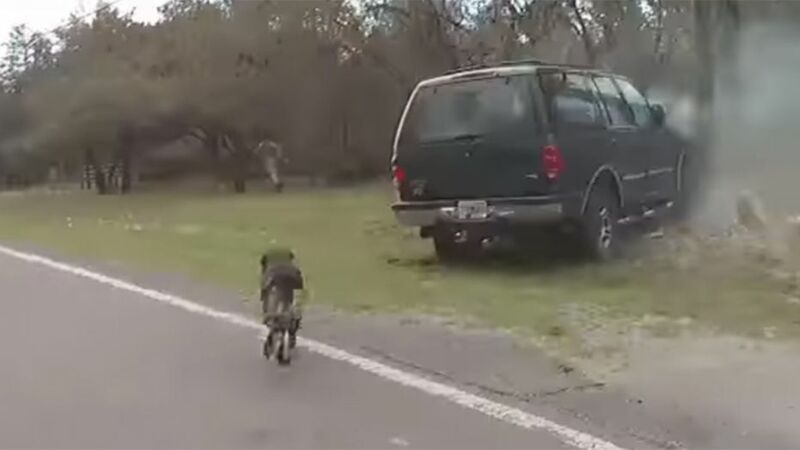 On Saturday, Pasco County Deputy Nick Carmack and Shep, his K9 partner, began pursuing a stolen Ford Expedition. The vehicle crashed into a telephone pole on Denton Avenue in Hudson, and the driver, whose name was not released, fled on foot. Shep took off into the woods to catch him, deputies say. The passenger also exited the vehicle, and Carmack detained and placed handcuffs on him. The Pasco County Sheriff’s Office released body camera video showing the apprehension. After cuffing the passenger, Carmack made him run with him to find Shep and the driver. Eventually, the footage shows, the unlikely pair came across the driver, who was firmly in Shep’s teeth.